Some vehicles may be more reliable than others, but generally speaking, you should be able to keep a car running long well into the 100,000 mile range by keeping it well maintained. There are lots of maintenance tricks that will keep your car running smoothly, some obvious, others less so. Here are ten maintenance tips that we at Eden Autos highly recommend. Just as we need the perfect balance of nutrients to keep our bodies going long into old age, your car will benefit from always keeping each of its fluids topped off. On top of gas, the main fluids include engine coolant, oil and window washer fluid. There are also other fluids that can benefit from being checked regularly in order to keep specific parts working. Brake fluid will keep your brakes responsive and should be changed every two years. Meanwhile, transmission fluid will keep your gears working smoothly and power steering fluid will keep your steering sharp; both of these should be checked monthly although you may never need to fill up either if you’re lucky. Most modern cars will generally offer warning lights when these fluids are low, while older cars may need to be manually checked. Evenly worn tires with a good amount of tread will make your driving smoother and safer. You should keep the air in your tires at the manufacturer’s recommended pressure. Too low or even too high can affect the tire wear and balance of your vehicle, and even cause damage to your suspension and brakes, not to mention making your steering less responsive or causing pulling to one side. In addition, you should periodically check the tread depth. Worn tires could potentially affect how they grip the road and can make your car more likely to skid and swerve. If there’s little or no tread left, you shouldn’t wait too long to buy new ones. And having them balanced and getting a wheel alignment will help to keep them from wearing unevenly. Your car battery is the power source for your vehicle’s electrical system, affecting everything from being able to turn on the headlights, to starting the ignition. The battery receives continuous charging from the alternator while the engine is running, but extended use of electrical equipment when the car is turned off, such as lights and radio, can cause the battery to drain. 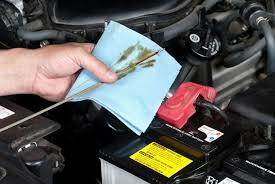 Cold weather can actually freeze the chemicals in the car battery, causing the battery to fail. Save yourself the hassle of having to use jumper cables, or calling for road service, by not using the car regularly in the cold winter months. Even if you don’t want to drive it, at least start it weekly and let it idle for about 15 – 30 minutes. Do you drive your car like a Formula 1 race car driver? In other words, do you accelerate hard and then have to slam on the brakes? On top of wearing out your brake pads faster, this type of driving will use up more fuel and affect other engine parts. Accelerating more smoothly and braking earlier will put less pressure on your car. Excessive dirt and grime on and under the car could eventually cause some exterior areas to rust, and a dirty car just doesn’t look very good. If you are in an area that does a lot of salting the roads in winter, that could also cause the car to develop rust. Washing your car, or running it through a car wash, will help both these issues. However, be careful of over-cleaning. Too much soap and scrubbing, especially as the result of overusing car washes, can start to give your car a dull appearance by wearing down the finish. Find the right balance to keep your car looking its best and maintaining its finish, without overdoing it. Some parts under the hood will wear down because of a lack of lubrication. Even though many of the under-carriage parts on today’s cars are self-lubricating, there are still some that can benefit from a little lubrication. Applying grease to these parts will stop them from grinding away, giving you many more years out of them. You can buy auto grease at any auto supply store to apply yourself, or get a mechanic to do it for you. Did you know that excessive direct sunlight on a hot day could be damaging your car? The sun can damage paint, cause the rubber lining on your doors to become brittle, and even make tires weaker. There are many waxes and finishes that you can buy to prevent sun damage, but if your car is parked outside for many daylight hours, one of the easiest and least costly solutions is to simply keep it parked in the shade; under a tree, in a garage or use a protective cover for times your car is in the hot sun for very extended periods. The moment you get a warning light on your instrument cluster, you should consult your car’s manual to find out what it means. Warning lights are there to alert you that your car needs some form of servicing or maintenance, and ignoring these lights could cause damage. Although sometimes a warning light might be faulty and may illuminate even when nothing is wrong, you should always check to find out the nature of the problem. You may have been ignoring a faulty warning light related to the brakes, but what happens if your brakes do one day decide to fail and you have no warning? Even if you do consider yourself a car wizard, it takes a professional with specialised equipment to find and repair many of the problems that your car can develop. The manufacturers recommended service schedule is designed to keep your vehicle running properly, and to catch any potential problems before they turn into expensive repair jobs. It’s also a good idea to get your car checked before you go on a long roadtrip. If there is a recommendation to replace a part that’s showing signs of wear, but for now, it’s still okay to drive, it may be forgotten about until it turns into a more serious problem. By having the part taken care of then and there, it could be a lot less costly and time consuming in the long run. We hope that our Top 10 Tips will help you keep your vehicle running well for many safe and repair-free miles, but when you’re ready for a new car or truck, Eden Autos will be ready to help you find the right one for you. At Eden Autos, we are always ready to help you get the right vehicle, at the right price, with the right financing in place. Call us at 215-977-4772, or stop in at 6213 E. Roosevelt Blvd, Philadelphia to meet our friendly, professional staff and see our extensive inventory of quality pre-owned cars, trucks and SUV’s.